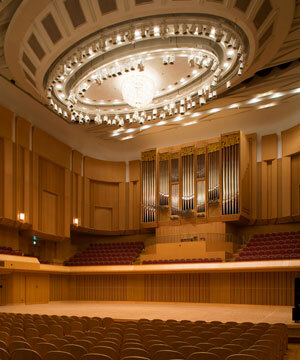 HARMONY HALL FUKUI has two concert halls with excellent sound facilities consisting of a Main hall and a Recital hall. Our concert halls fully bring out the charm of music from classical music to jazz, opera, etc. 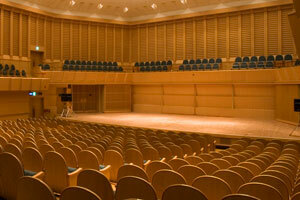 Our concert halls are available for various types of music performances such as small ensembles, family concerts, etc. as well as large-scale concerts. You can experience stirring music by live performance at this magnificent hall with a pipe organ installed in the center behind the stage. Profound acoustic space of Main hall has been highly evaluated among prestigious musicians. 1,456, including 10 wheelchair seats. This hall is easy to use even for small-scale concerts. You can readily utilize this hall for small-scale concerts such as ensembles, piano recitals, etc. 610, including 6 wheelchair seats. 9:00 a.m. to 10 p.m. Opening hours：9:00 a.m. to 10 p.m. Reproducing articles and photos listed in this website without permission is wholly forbidden. All the copyrights are owned by Fukui Prefecture Organization for Cultural Promotion.